The park called on Saturday morning, where we stopped by the market at Allseley Park Walled Garden. I almost bought yarn, but was distracted by cake at the last moment. Whether this was a good or a bad thing is still up for debate! We stopped by the potato beds, to visit M's potato which we'd planted earlier in the year but couldn't see the marker under the overgrown bed. We'll hopefully go along to dig up any resulting potatoes later this week, so fingers crossed we get a crop. 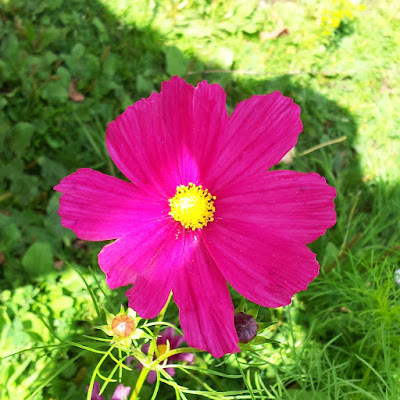 Yarn stroked, cake eaten and potato visited, we continued our walk around the park with the highlight for all of us being the wild flower meadow. 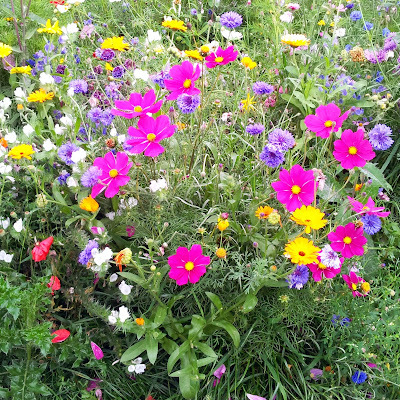 Coventry has taken to seeding unused parts of parks, grass verges and roundabouts with wild flowers, something I heartily approve of. 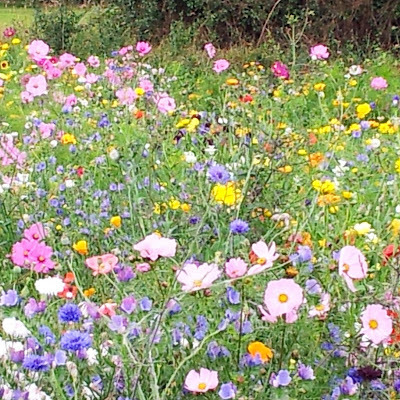 Allseley Park was in full bloom, presenting us with an impressive field of colour. 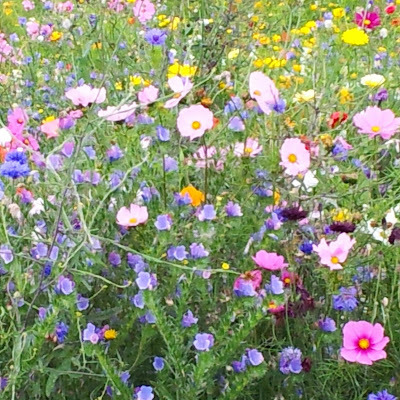 Wild flowers in full bloom. M was particularly impressed with the vivid pinks and oranges, insisting that I take several pictures. 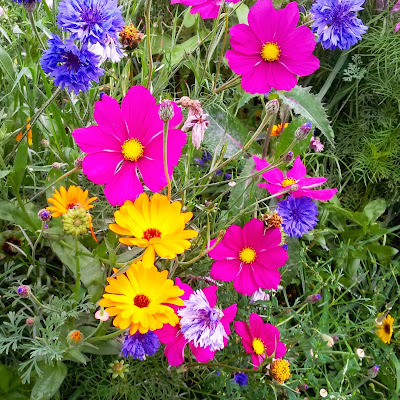 M was particularly drawn to the colours in this clump of flowers. Can you blame a girl for loving these colours? We also stopped by the pond, startling a family of moorhens who sped for the cover of the reeds, only coming out again when they were certain we weren't going to do anything dangerous. Looking at the rubbish other visitors had thrown into the pond, I fear they were right to be wary. We were on the lookout for newts, newtlets and froglets, but alas saw none. We did spot a fish in the water, but my phone's camera was unable to pick it out. we had seen, I suggested M could do some painting. I'd been keen to show M how wax resist worked with watercolours, but our crayons needed a firmer pressure to transfer enough wax to the paper than M was able to manage on her own. Hence this turned into a collaborative project, with me drawing the wax designs sometimes by my own initiative and sometimes under M's careful direction. I painted a couple of sheets myself, but these are mostly M's creations. 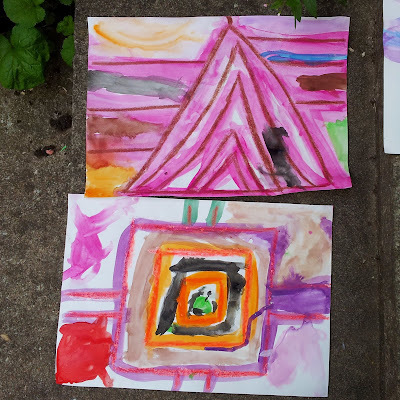 The idea was to draw geometric designs in wax crayon, then paint over the top using watercolours, followed by a wash of water. 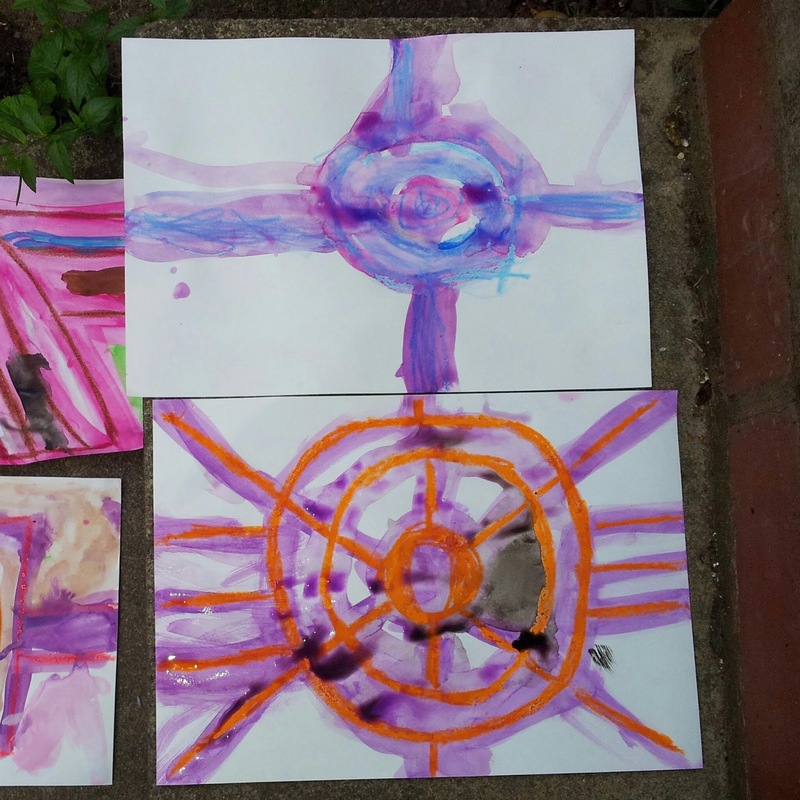 M's use of colour is vivid and she found the effect of adding a water wash interesting.